These are the rules of Sean’s Guest House: First of all thanks for your coming to choose our place! 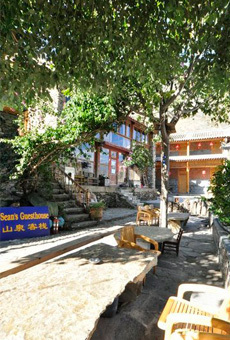 if you make booking room by online in our this website: www.tigerleapinggorge.com ,is free booking service and you will get 15% diccount price. Also hope everybody can cognitive, here is the valley, all the hard-won! You come to the consumption of the house is not a dish; A room; A bottle of beer price, hope you can understand the value of investment is needed to create such an environment and culture quality, the value of different atmosphere is different, we offer you is a unique atmosphere. 1：Please register your passport details and make payment for the room at check-in. 2：Check-out is 12:00 (noon). Should you wish to check-out between noon and 6 p.m. a half-day rate will be charged. After 6 p.m. a full day’s rate will apply. 3：If you wish to stay for a further period of time, please inform reception prior to 12:00 (noon). 4：The master power switch for all electrics is by the entrance in each room. The individual switches for all electrics are located on the bed side table. Please be mindful of the environment and save electricity where you can. 5：Water: Left for hot, right for cold! You may need to wait 5-10 minutes for the water to warm up. 6：Your breakfast is not included in the room rate but a delicious choice is available! 8：Cancellation: If your reservation is cancelled up to 3 days prior to arrival, no fee will be charged. If your reservation is cancelled later, or in case of no-show, 100% of the first night’s fee will be charged. 9, Except China holiday every time one week, like February spring festival, May and October gold holiday two weeks, August moon festival two weeks busy holiday. If you book room on line in our website, follow room show price in our website, we will give you at least 15% off discount price and free booking service. Thank you for your cooperation, we hope you have a happy stay!